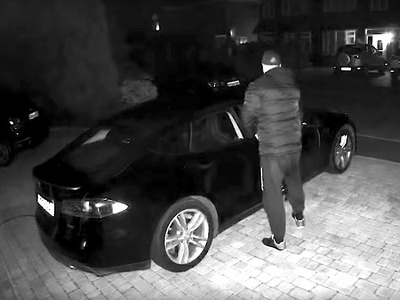 Antony Kennedy/YouTubeAntony Kennedy’s stolen Tesla Model S.
A senior tech executive has posted a YouTube video of his Tesla Model S being stolen on Sunday morning. The video captures two darkly dressed men stealing the car by hacking into the car’s key fob with what appears to be a tablet. Antony Kennedy made the video after he posted about the theft on a Tesla forum and was accused of fabricating the story. A senior tech executive’s video of his Tesla Model S being stolen is going viral on YouTube. Antony Kennedy, a manager at a big tech firm who lives in Essex, England, bought a Tesla Model S second-hand for £45,000 ($US58,000) about nine months ago. He told Business Insider that, at 2 a.m. local time on Sunday, two men stole the car by hacking into the car’s key fob with what appears to be a tablet. They did this by capturing its “passive entry” signal, which automatically unlocks the doors when the car is approached with the key. In fact, the thieves had more problems removing the Tesla’s charging cable than entering the vehicle itself, as footage from Kennedy’s doorbell camera and mounted security camera shows. Kennedy verified the footage by providing Business Insider with paperwork on his Tesla. At the time of writing, the YouTube video has amassed more than 50,000 views. Kennedy said he made the video after he posted about the theft on a Tesla forum, and was accused of making the story up. “I got quite upset and that’s why I made the video… to shut them up,” he told Business Insider. Kennedy admits he did not activate Tesla’s PIN to Drive feature, which could have prevented the theft. He wishes, however, that disabling remote access on Teslas was harder, as the thieves disabled the internet connection so neither Kennedy nor Tesla can now track the car. “Due to the growing number of methods that can be used to steal many kinds of cars with passive entry systems, not just Teslas, we’ve rolled out a number of security enhancements to help our customers decrease the likelihood of unauthorised use of their vehicles. “None of these options would be possible for any traditional automaker – our ability to update software over the air to improve functionality and security is unique. Kennedy reported the incident to Essex Police, but is pessimistic about ever seeing the car again. He said that after posting the video on Facebook, another Tesla owner sent him footage of two men attempting to steal his car in London a few months ago. Kennedy believes it to be the same suspects. Business Insider has contacted Essex Police and The Metropolitan Police for comment.